Using a quality wheel clamp as opposed to locking lugs nuts will further prevent theft of your trailer or vehicle. They are much larger and this makes them harder to remove as well as being a better visual deterrent to potential criminals. The best trailer wheel lock is the Heavy Duty Coocher Clamp, which is a universal fit for a range of wheel sizes and are easy to operate for maximum security. Unlike other types of security devices, wheel clamps are highly visible and often finished in a yellow or red in order to standout even further. They are the best option for securing your classic car, RV, trailer, ATV or anything else with a wheel. The main types of trailer wheel locks that you will come across include a wheel clamp or claw. The main benefit of the wheel clamp is that it blocks access to the lug nuts but it does involve more effort to install and store as well as being more expensive. Theft of vehicles and trailers is far too common and can be easily avoided by using a trailer wheel lock. Using the clamp or claw whilst parked up for long periods of time will ensure your car or trailer is as secure as it possibly be. Below is a list of the best trailer wheel locks that will act as a visual deterrent to potential criminals and prevent theft of your trailer. The Coocher wheel clamp is a powerful anti-theft lock that is universal and can be adjusted to fit a range of different rim and tire sizes. It has a bright yellow finish, which is an obvious deterrent that will be seen by any potential criminals. Coocher claim that it is easy to operate with a gentle push of the key hole to lock it in place. The soft grip handle feature may seem pointless but for cold or wet days, it makes using this wheel clamp far more easier without any slipping. Overall, it is the best trailer wheel lock for the money that prevents the wheel being taken off. It simple to use yet virtually impossible to break for car criminals. The Trimax TWL100 is the most expensive wheel locks in this article but it does have many premium features. These include a heavy duty steel construction that covers the lug nuts to avoid the removal of the wheel. In terms of installing this trailer wheel lock, it is as simple as sliding it around the wheel and cranking the lock tightly to the wheel. Trimax claim that the TWL100 wheel lock is “the world’s toughest lock“, which is quite a claim. Overall, the Trimax TWL100 is an excellent all-rounder but it is slightly expensive compared to the Coocher alternative mentioned above. The Club brand are known for security and have many steering lock options for drivers requiring a different anti-theft device. This claw maintains the reputation as it can be installed in seconds and self locks without the need of a key. 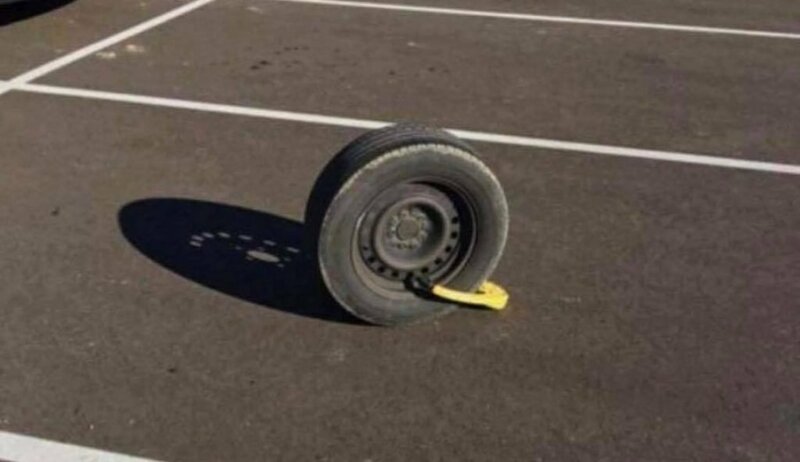 The trailer wheel lock by the Club brand is fairly expensive but they are known for producing excellent automotive security devices. Features such as the self locking capability make a huge difference and are worth paying the extra. The 491 Tire Claw XL is the best type of wheel lock they produce but there are cheaper alternatives offered by the brand. For those looking to completely immobilize each wheel in order to prevent rotating and turning, TMS have the solution. The 4 piece kit is made using heavy duty steel and is adjustable from 6 3/4 inch-10 1/2 inch, which is fairly universal. To operate, simply slide the adjustable claw to the size of your rim and then lock it in place, it is that simple. It acts as a powerful deterrent and is a strong, durable and well-made anti-theft device that will secure a range of vehicles and trailers. For those on a budget and looking for a cheap wheel lock clamp made from heavy duty steel, this is the best option. It is fully adjustable with 16 locking holes and covers the wheel lugs for excellent all-round protection. It is the best cheap wheel lock for trailers that is easy to use and durable enough for many years usage. There are a few other cheaper alternatives but the this wheel lock but the OKLEAD wheel clamp covers the lug nuts, which is highly desirable. There are various types of anti-theft devices for securing your vehicle or trailer from criminals. One of the most popular is by using a trailer hitch lock but even that can be beaten fairly easily. Using a trailer wheel lock in the form of a clamp or claw is a visual deterrent and effectively prevents theft of your trailer or car. They stop the wheels from rotating and are virtually impossible to break without making noise. Trailers are expensive and without adequate security measures, they can be easily stolen. The trailer wheel lock is one of many methods that act as a visual deterrent and make thing very difficult for the criminal attempting to steal your trailer. To help you make an informed buying decision, we have produced the below buying guide regarding trailer wheel locks. A major flaw for many wheel clamps is the fact you can simply take the wheel off the car or trailer that is clamped. If you are able to do this, so is the criminal but you can prevent this with locking lug nuts. Some people are in favor of wheel locks that cover bolts whereas others prefer using a claw lock with locking wheel bolts. Either methods are highly recommended but if you are using a claw, ensure you have locking lug nuts installed. Failing to do this can see the below image being what is left of your trailer. Metal on metal contact will almost certainly damage your wheels. You will want to ensure that the clamp is either soft powder coated over the heavy duty steel or has soft PVC to prevent scratching. It only takes a slight movement to cause damage, so it’s an important factor to consider with all the above clamps satisfying this prevention method. Most of the wheel clamps or claws within this article are suitable for both cars, trucks and trailers. Each wheel lock will state the different sizes that it is suitable for and the amount of adjustment. You will want to measure the total diameter of the wheels as well as the width and ensure the lock is compatible. Protecting your pride and joy that be a car or even a trailer can be achieved with an anti-theft wheel lock clamp. Using multiple forms of security brings more benefits and worth investing into to increase the security and warn off car criminals. Choosing between a full covered clamp or a claw is based on your personal preference. Just be sure that you have locking wheel nuts installed if you are not planning to cover them.